Small Business Bookkeeping implementing QuickBooks or accounting/bookkeeping software specifically for your business. Daily Money Manager services including bill paying, financial maintenance, health insurance follow-up and paperwork support. Howard Edelstein MBA – Fraud seems to be a more frequent problem not only amongst older people, but anyone performing periodic financial transactions. Whether it be personal or businesses through their bank accounts, credit cards or the mail, to mention a few. It is always a good idea to have a second set of eyes on mail, bills, bank accounts or any activity of monetary value, especially if you are having difficulty maintaining your financial obligations on your own. I have seen businesses experience unauthorized check cashing through their business and personal accounts. Sometimes both. Especially if you make transfers from business to personal or vice versa. There are companies such as LifeLock that do a great job protecting your bank accounts, but they can’t stop the intrusion immediately. The situation could get worse before it gets better. I was speaking to Chase this morning because someone tried to conduct a charge card transaction clear across the country at 2:00 AM, through an account that wasn’t theirs, nor had the card been used in years. The victim was my client. The card hadn’t been used in a two years. I immediately closed the account. Chase said with the holidays approaching, they expect more instances of fraudulent charges. They agreed with me that these events seem to be increasing. Measures you can take to protect yourself is to have someone assist you in reviewing your credit card or bank statements if you are lacking the physical ability or time to monitor these statements. Do monthly bank and credit card reconciliations. Watch over your bills. If something doesn’t look right, its probably not. Question anything that doesn’t seem correct. Read your mail carefully. Don’t give credit card or any personal information to anyone. Fraudulent emails are one source of illegal activity asking people for personal information to correct a problem. The telephone is another. Sometimes companies will place a phone call to you misrepresenting themselves as a company you do business with asking for personal information. For example, telephone and utility companies make frequent phone calls saying they are Verizon or PSE&G wanting to discuss your account. Don’t take their word for it. The best thing to do is contact the company directly yourself or through someone you trust to find out if the phone call you received is legitimate. Most of the time it is not. Never give out financial or personal information before verification of who is asking. Companies will take your recorded voice answering “yes” to one question and dubbing the “yes” into an unrelated question. For example. “Are you happy with your service?” You answer “yes”. When you start getting bills from another company, you call to question the bill and ask when you authorized them to take over your plan. They will play you a recording stating, “Do you accept our terms?” Your “yes” answer will be dubbed right after the question about accepting terms. I have witnessed this first hand. It is inconceivable how far companies and people will go to take advantage of innocent victims. You need to protect yourself and your businesses from these and many more potential fraudulent intrusions. If you feel you cannot adequately protect yourself due to physical or time limitations, find someone to help that you trust like a relative, friend, daily money manager, bookkeeper or anyone else, after you are sure they are watching out for your best interest. Optimize Your Time. Outsource your Bookkeeping. 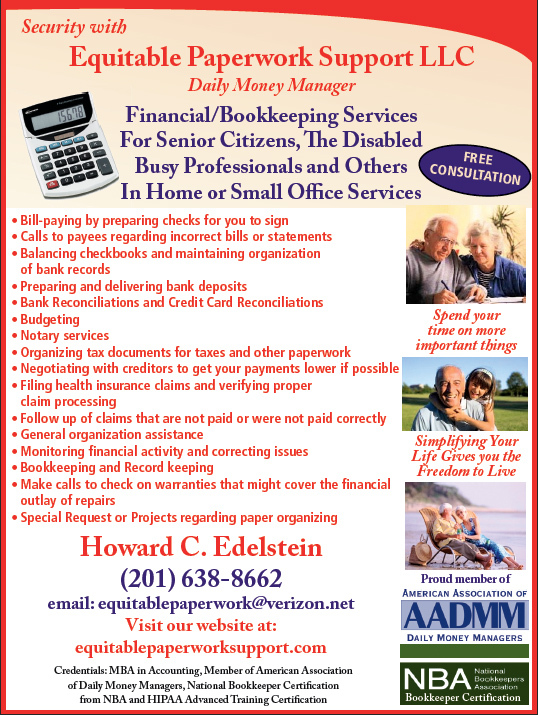 Howard Edelstein MBA– Bookkeeping services for small businesses and Personal Daily Financial Management for individuals in NJ. Too many small businesses find that they don’t have adequate time to devote to business matters and growing their business, because they have hours of paperwork and bookkeeping tasks ahead of them. If you outsource your bookkeeping, you can optimize your time to what you do best. Apply your skills to your business. Outsourcing has many advantages.You can hire a bookkeeping service with credibility and monitor the results. You won’t have to pay employer taxes for an independent bookkeeping firm. They pay their own. They also provide their own benefits. Many experienced bookkeeping services know what needs to be done in a orderly and timely fashion. You don’t have to spend hours doing bank reconciliations, credit card reconciliations, recording business activities, postings and preparing financials. You just have to concentrate on the financial results. Then take action where needed, and explore other growing opportunities for your business. We have many resources available to us and limited time. We need to take advantage of those resources in a productive manner and apply our strengths where most beneficial. Disaster Unemployment Assistance has been expanded from ten New Jersey Counties to cover all New Jersey counties as a result of Hurricane Sandy. This affects self-employed individuals who would not ordinarily be eligible for NJ unemployment benefits and those employees who are unemployed as a direct result of the storm. Most workers are qualified for regular unemployment and should file a regular claim for Unemployment Insurance first by going to www.njuifile.net. There are a high volume of claims filed as a result of Hurricane Sandy. Individuals are encouraged to file through the internet. between 6 PM and 8 AM. Also, Sundays are a good day to file on the internet. You can also file by telephone, but it won’t be as fast as the internet. If you want to speak to a person there was up to a three hour holding time on November 8, 2012. The way around that, is the recording will ask for your phone number and you will get a call back without losing your place. I tried this yesterday for some people that work for one of my client’s businesses, and I did receive a call back later as promised. The person I spoke to was also very friendly and helpful with my questions on behalf of my client. There are boxes on the unemployment application that you can check which state Business Closed/Hurricane Sandy. You might have to enter your email and choose a password. The rest of the process is very straightforward. My advice to you would be to print out the last page after you have submitted your application in order to have backup. Also, there is a 30-day deadline for filing claims. A 30-day deadline ending December 3, 2012 is in effect for filing DUA claims involving employment issues arising because of Hurricane Sandy in Atlantic, Cape May, Essex, Hudson, Middlesex, Monmouth, Ocean, and Union counties. A 30-day deadline ending December 6, 2012 is in effect for filing DUA claims involving employment issues arising because of Hurricane Sandy in Bergen and Somerset counties. A 30-day deadline ending December 10, 2012 is in effect for filing DUA claims involving employment issues arising because of Hurricane Sandy in Burlington, Camden, Cumberland, Gloucester, Hunterdon, Mercer, Morris, Passaic, Salem, Sussex, and Warren counties. For additional information, you can visit http://lwd.dol.state.nj.us/labor/ui/aftrfile/dua.html. If you are overwhelmed by bills or simply do not have the time to get organized and pay your invoices, the worst thing you can do is ignore them. I help people in this situation every day, and find that getting yourself out of the unpaid bill nightmare takes organization, budgeting, negotiation with creditors and communication. I do all this and more for clients as a daily money manger. 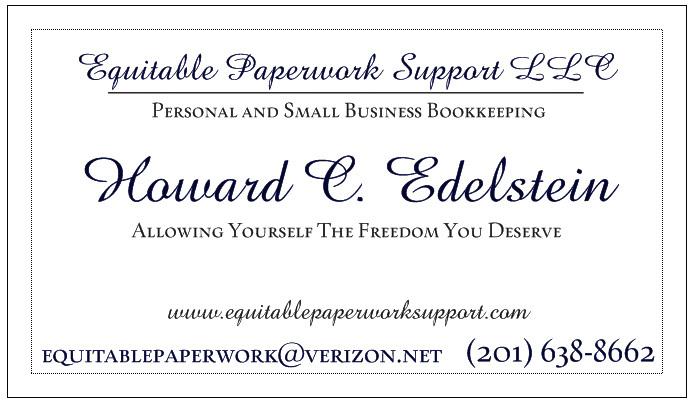 You can find more information on my website, http://equitablepaperworksupport.com. I have been on both sides of the fence working as a creditor or payee, and working on the client’s behalf as a representative for him or her. The worst thing you can do is ignore invoices all together. Looking at it from the creditor, no communication means one thing. “I don’t care and will not make an effort to pay.” From the view of the business you owe money to, there is nothing to do but send you a delinquency notice and inform you that the next step is sending you to collections. Your credit rating will drop, your ability to apply for credit will be limited, and you might even have your wages garnished if a Judgment is issued against you. Communication with the creditor will show that you are interested in clearing up your balance. I have found that most creditors are willing to work out mutually acceptable payment plan, because they realize that a plan is the only way they will get paid if you are having financial difficulties. As soon as you see that you are having problems getting your payments out due to lack of time, lack of funds, lack of understanding of your invoices or health insurance, or are just simply disorganized, the time has arrived for you to seek help from a person such as myself, a daily money manager. The longer you wait, the greater the magnification of the problem. You can simply go to https://equitablepaperworksupport.com/contact-us/ or call me and I will be available to help you if you are in northern New Jersey or surrounding areas. If you are from a different area, I can refer you to someone that can help you. Even if you think a problem cannot be solved, most times the answer is right in front of you. There is always a solution. Don’t be embarrassed to seek help. A daily money manger upholds strict confidentiality laws for your benefit and security. There are many times when Senior Citizens have a large pile of mail and bills. One day goes by, then another and then another. Before they realize it, there is a pile of mail building, some of it unopened. Some elder people will see the paper stack getting higher and don’t know where to begin. One way of coping with this situation is to move the pile somewhere else. Maybe put it in a box or separate it into different stacks of bills and mail. These are ways of avoiding the work ahead of you without diving into it head on. As time passes it gets more and more overwhelming. It may also be embarrassing. Some Seniors hide the bills so they are out of view. What they need is someone to help them, because the truth is, they will never get to it themselves. They might ask their adult children to help, but the adult children might be too busy to find the time to go through all this mail. Their children might not live nearby. Another situation could exist when Seniors physically find it extremely difficult to tackle their bills. They can’t write checks themselves and need assistance. Maybe some seniors do not understand the detail of their mail. They need someone to decipher and explain the bills to them. They need someone to check the bills for accuracy. In some marriages, the wife might pay the bills while the husband is responsible for other things. Maybe the situation could be reversed. What if the couple separates or worse if one of them gets sick or passes away. If you are not used to paying bills because your spouse always had that responsibility, taking on this task on could be too much for you. When occurrences such as these exist, you need a Daily Money Manager. A Daily Money Manager could write checks, balance checkbooks, reconcile to bank statements, look over bills for accuracy and correctness, make calls to companies to correct errors for seniors, make up and deliver deposits, explain details in correspondence to individuals, work up budgets for them and provide financial maintenance for them. Without Daily Money Managers, senior citizens or anyone else could start getting past due bills which in turn, will affect their credit rating. Daily Money Managers will take away the embarrassment, frustration and stress of taking care of personal finances. They can also provide free time for seniors, of which is highly deserved. Seniors should have time for themselves and their families. Elder financial abuse as elderplanner450 below states as a growing problem, comes from many different sources. It can occur from the closest people in your life to someone simply selling you a package if goods you don’t need. Having resources readily available to elders such as geriatric care counselors, senior care advisers, daily money managers, can help block the intrusion of abusers. Someone who watches over your daily financial obligations should be able to spot misappropriations of funds very quickly before real damage is done. That is why it is never a good idea to wait before seeking help. Assistance is becoming more obtainable these days, and it is not fair to yourself, an aging parent or anyone to not take advantage of these services. Unfortunately, this is the world we live in. Therefore we must protect ourselves from unforeseeable negative financial attacks that come our way. Utilizing the resources available is without question, an important step in the right direction. As of September 1, Community Banks and Credit Unions can now offer their older depositors a full range of information and referrals on elder services and caregiver support nationwide. The service includes a toll-free multilingual telephone consultations with experienced geriatric care counselors who have access to sophisticated continually updated proprietary data base technology to track the vast array of elder care services that make up the complex system of elder and long-term care services nationwide. The community bank can now become a leader in the fight against elder financial abuse, a growing problem that the Wall Street Journal has called “The Crime of the 21st Century”.